The AccountingSuite team will be showcasing their newest update, Saint Bernard, during the state’s largest CPA gathering at the 8th annual New York Accounting Show & Conference (July 13-14, 2016) - #FlaggNY2016. 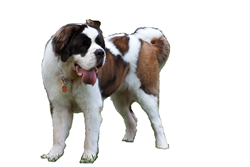 The St. Bernard was bred for gigantic friendliness, weathering arctic storms and saving lives with their love of digging in snow. “We’re obsessively focused on the user experience for the accountants and business owners we support,” said Jay Larson, Customer Success Manager. “We’ve invested heavily in our user’s top feature requests and product enhancements." Accountants can use cloud business software where one account serves multiple clients, one window can execute multiple tasks and cloud-based access provides accessibility on any browser at any time of day or night. AccountingSuite will be exhibiting at Booth #331 at the Penn Plaza Pavilion of the Pennsylvania Hotel (401 7th Ave., New York, NY 10001). AccountingSuite is a powerful, all-in-one business application that combines accounting, banking, order management, inventory management, project and time tracking into one cloud-driven platform. Visit http://www.AccountingSuite.com or call, 415-GO-BLISS (415-462-5477).